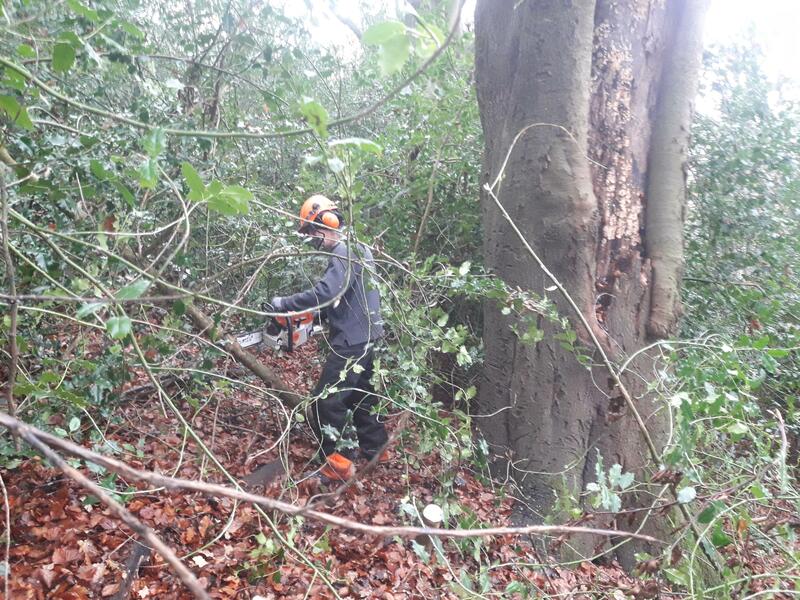 The last few weeks the volunteer group have been carrying out some woodland management at St Edwards Park near Cheddleton. The woodland hear hasn’t seen any management for some time. The first job was to remove some medium sized sycamores that were threatening to start shading out the native oaks in the canopy. Giving these oaks a bit more space will give them chance to gather more light from the sky and more nutrients from the ground meaning they will be able to grow to their full potential. 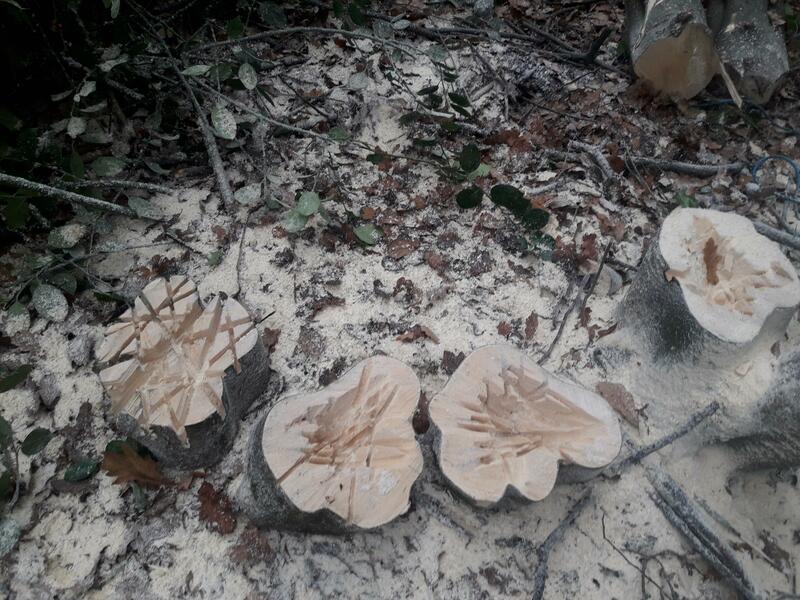 We’ve also taken a few sycamores out that were surrounding a veteran beech tree. Veteran trees like this provide rare microhabitat for such as holes for birds to nest in, and dead wood for beetles and other rare invertebrates to feed on. Giving the tree a bit more light will increase the longevity of the tree and warmth from the sun will mean the invertebrates can grow and reproduce quicker. The other major task we’ve got stuck into is holly removal. In many woodlands, holly used to be grazed by large mammals like deer and wild boar. However in many modern woods these creatures are absent so holly can take over, smothering the forest floor and out-competing the canopy trees in much the same way as Rhododendron can. One particular patch at St Edwards has formed a huge dense stand smothering some mature oaks and beeches. In fact as we starting removing holly we found three more veteran beeches that were completely hidden before. 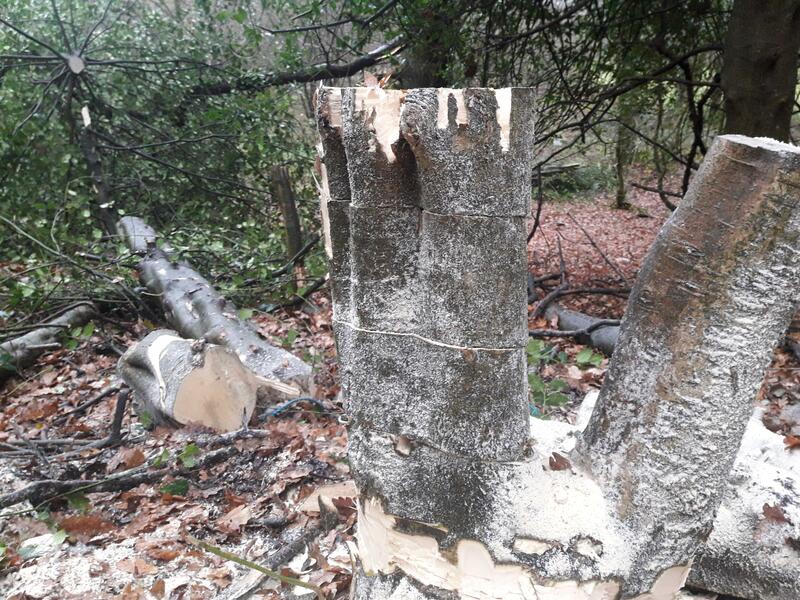 With so many stumps being left behind from all the problematic trees that have been removed we’ve taken the opportunity to use a new, innovative technique to create microhabitat for invertebrates and fungi. These are called stump wells – you cut a tree high leaving a nice big stump. You then perform a coronet cut on the top of the stump to replicate the shattered stump from a tree that has fallen naturally. Then you slice top off and set aside to later form a lid. You then use a chainsaw to bore down into the stump forming a small well, before replacing the lid. The idea is that the well will fill with water in and as the wood rots provides a home and food source for very rare saproxylic (a posh word for those that rely on dead wood to survive) insects like certain species of hoverfly larvae. They replicate the conditions found in rot holes very large old trees that are, sadly, few and far between in our modern landscape. We’ve also got a little creative and built some “multistory” stump wells to make the most of the stumps that we have. It’s great to have got stuck into some good old fashioned habitat management. Next spring and summer it will be interesting to see the new wildlife move in after the work we’ve done. If you’re interested in volunteering on similar conservation projects within the Churnet Valley please feel free to contact me for me more details.